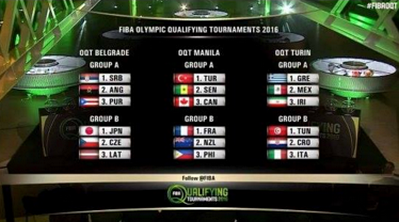 Olympic Qualifying Tournament Groupings, Philippines in Group B (Manila Tournament): Teams and Initial Schedule of Games Here! The Philippines will become one of the centers of international basketball in July 2016 as it gets to host one of the 3 Olympic Qualifying Tournaments. Teams that are set to fly over here in Manila are Turkey, Senegal, Canada, France, and New Zealand. The first three will be in group A while the latter two will join Philippines in group B. According to Dean Quinito Henson, "the Philippines will go against France and New Zealand in the group stage of the FIBA Olympic qualifier at the MOA Arena on July 5-10. 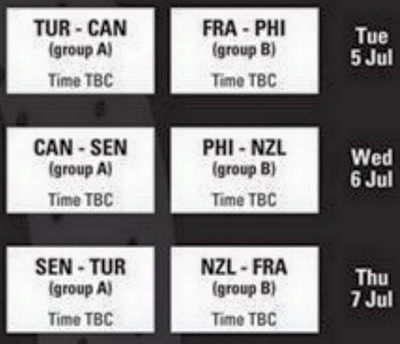 Turkey, Senegal and Canada in the other group of our qualifying tournament." "France may not bring over Batum and Diaw who will be negotiating new NBA contracts during the qualifier but Tony Parker will come if he's healthy ‪#‎FIBAOlympicQualifyingDraw‬ ‪#‎fiba‬ ‪#‎LabanPilipinasPuso‬," The Dean added.